Apple on Tuesday updated several of its official iOS apps —including the iWork suite —with minor improvements, but most significantly added Apple Watch support to Keynote, allowing remote control of presentations. The Watch extension is known as Keynote Remote. It was briefly teased during an Apple press event in October last year, but has otherwise flown under the radar. 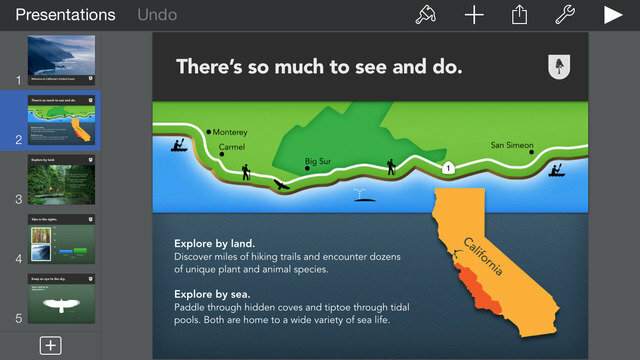 Like Microsoft's newly-available PowerPoint Watch app, users can control presentations on their iPhone, but not on a Mac or iPad. Other apps updated today include Pages, Numbers, Remote, and Beats Music. All four, though, have only received fixes for bug and stability problems. Most of Apple's non-bundled iOS apps have yet to receive Watch functions. That's liable to change within the next several days, as the wearable is due to ship on April 24. Apple frequently updates supporting apps in tandem with major hardware or operating system releases.